Sharon Shannon kicks off the New Year in Ballymaloe Grainstore, performing the first concert of 2015 on Friday 2 January at 8pm. The Irish accordionist has achieved legendary status throughout the world and made the accordion ‘cool’ in her home country. She is renowned for her collaborations, not just in Irish traditional music, but through all musical genres, from hip-hop, cajun, country, classical to rap. Sharon has recorded and toured with a ‘who’s who’ of the Irish and international music Industry, including Bono, Adam Clayton, Sinead O’Connor, Jackson Brown, John Prine, Steve Earle, The RTE Concert Orchestra, The Chieftains, The Waterboys, Willie Nelson, Nigel Kennedy, Alison Krauss and Shane MacGowan – a list that is testament to Sharon’s versatility as well as talent. She has entertained U.S. Presidents Clinton at the White House and Obama in Dublin, and Irish Presidents Robinson and MacAleese on presidential visits to Poland and Australia respectively. More recently she played for The Sultan of Brunei in Sydney. Sharon also celebrates being the youngest ever recipient of the Meteor Lifetime Achievement Award. Her music has been featured in several Hollywood movies, TV series and the award-winning Bulmers TV commercial campaign. A prolific composer, Sharon continues to defy genres and has recently released an album of original music recorded with the RTE Concert Orchestra called Flying Circus. and is currently co-writing songs with many collaborators. Currently working on an autobiography, Sharon is a passionate animal lover and does a lot of voluntary work and fundraising for various animal rescues and supports many other charities. 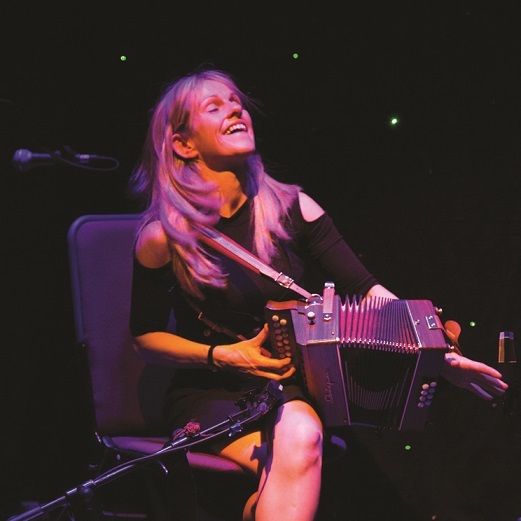 Tickets for Sharon Shannon on Friday 2 January are €27. Early dinner in Ballymaloe House (6pm) and ticket are €75.